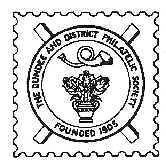 Dundee & District Philatelic Society is a local society (founded in 1905) and is the second oldest society in Scotland. It is devoted to the collecting and study of philately and meets regularly between September and April each year. Do you have an interest in Stamp Collecting, Postal History or any other branch of philately?, then why not come along to one of our meetings and meet other people interested in the same hobby. Our current membership stands at 32 members, the majority of whom attend most of our meetings. Society	meetings take place usually on the 2nd and 4th Thursdays of each month at 7:30pm at Dundee Art Society, Roseangle Gallery. You can see details of our yearly syllabus below. Don't have a password to log in? If you are a member contact the Webmaster and a password will be e-mailed to you. The last display night of the season was held on Thursday night, where members were entertained by a display of Greenland from George Henshilwood of the Caledonian Philatelic Society. For more information on this display and to see all the news items Click here. The next informal meeting of the society will take place on Thursday 2nd May 2019 at 10am at Art Society Gallery, 17 Roseangle, Dundee. This page was last modified on 15th April 2019.